Are these the same type of "leek" that's used in French cooking for example or is the Chinese version different? The leeks we find here in the US tend to be quite large and the green portion can get very tough. But we have tons of Asian markets where I live and I might be able to find the Chinese version if I knew more what to look for. Nice tip. However... don't suppose you have a picture of these suan miao / leeks? Because as with many vegetables, there are different interpretations of what "leek" means. I assume you're not talking about the big, thick leeks in the European sense of the word. They are a standard ingredient in pad thai and char kway teow, by the way. Hi Kristina and ES -- these are neither garlic chives, nor are they the garlic shoots in the link that ES provides. Though "miao" means shoot they are perhaps best described as baby leeks (but I'm not sure that they're the same variety as are eating in springtime in Spain, grilled). Much like the leeks the woman in the photo is carrying, but smaller and more tender. The white part isn't used in this preparation. Scallion greens work wonderfully. Or I'm sure any tender green of a relatively young leek would substitute. Looks delicious! Too bad they are not garlic chives. 15 years ago I planted two plants in my yard and now they are everywhere--not that that is a bad thing...I am making Sichuan bacon today and we will have to try the greens and bacon when it is done. Thanks Shayma! Do Pakistani cooks use Sichuan peppercorns/prickly ash? Sharon - I'd go ahead and use garlic chives. Why not? Just not nearly as many. The overall point is to use something "green" to lend flavor instead of chopped garlic. Makes for a more harmonious dish. Also: I **love** to toss lots of chopped garlic chives into Chinese-style tomato stir-fried with pork, or stir-fried egg and tomato. This makes perfect sense. 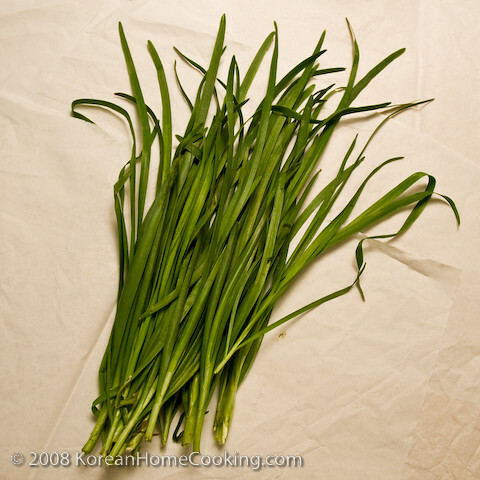 I see small "leeks" and green garlic in the farmers market and at the local Korean market in season and have used them with greens. They keep that vegetal thing going and add their own similar texture and enough "garlic type" flavor to complement the different green notes. Thanks for mentioning not using garlic btw, I always wondered how you prevent it from burning especially if you don't use glucks of oil. Peter - it's leek, the veg pictured in your link (the characters are suan miao). But in Chengdu markets at least you find young or small leeks and big leeks. Greens from the younger, more tender leeks would be used here. Thanks for that link by the way, I'm going to add it to the post. Suan Miao is more appropriately translated as Young Leeks. Miao 苗 originally means young grain shoots – you can see in the character – green shoots on the grain field. Now generic word for young shoots. Leek is commonly known as Da Cong 大葱(literally big onion)，as opposed to Xiao Cong 小葱 (small onion, ie spring onion) and Qing Cong 青葱 (green onion, ie scallion) 。The use of Chinese words associating garlic (Suan) and onion (Cong) is casual and that is why often you see a green that looks like leek but is called garlic in English. For example, don’t remember which link or what it’s actually called there, but the Chinese garlic shoots is actually the leek shoots (I think) you called in one of Mr Zhang’s stir fried Larou dish. In Peter’s link – leek is Suan Miao/Da Suan (which literally translated into English garlic shoots/big garlic). Da Suan is another name of Suan Miao only in part of China, mainly Beijing, Shandong and the more northern. Otherwise, it is commonly known as big garlic clove. I remember I used to wonder back home why these Shandong mantou guy asked if I wanted Da Suan (big garlic) with mine, when he actually meant Da Cong (big leek). It is not difficult to identify in a Chinese recipe whether it is garlic clove or leek when you see the word Da Suan and wonder which one it is referring to – you tell by the measure word, Yi Ge Da Suan would be one garlic; Yi Gen/Zhi Da Suan would be one leek. The only two greens that I happily eat with garlic and quite like it actually are spinach and Dou Miao (green pea shoots?). But the finely chopped garlic is added and tossed at the end which remains crunchy but not burned. (perhaps when the heat has been turned down). The worst one I had in UK is with brocolli which over-powered and ruined the freshness of the veg. Katy, good point. I also like garlic with pea shoots and spinach. Big difference is that both of these are tender greens which need hardly any cooking, so the likelihood of burning the garlic, even if you don't toss in at the end, is miniscule. Hard not to burn the garlic when you're cooking a green as sturdy as youcai. Christy, I'm not sure which type of leeks you're referring to (and are you writing from Malaysia or? what kinds of dishes?). A dish I've eaten often in Malaysia is tofu stir-fried with leeks, the white part. And the leeks in our Chinese veg store are not as huge as the ones in the photograph above, of the woman on the street, but not as small as the young leeks in Sichuan that Mr. Zhang (and others) use with their greens. What a charming post -- and an important lesson about flavor! Thanks so much for sharing this: I only recently discovered your blog and can't wait to read more (and more and more). Can I have the address of the places which you wrote in the newspaper in mandarin?